Harry N. Abrams, 9781419710209, 248pp. "This book is aimed at middle schoolers, but this poignant story is one people of all ages will enjoy and can learn from." "Bell’s book should be an inspiration for those who are ‘different,’ and it should help others to understand just what being different means. Required reading isn’t always fun reading. 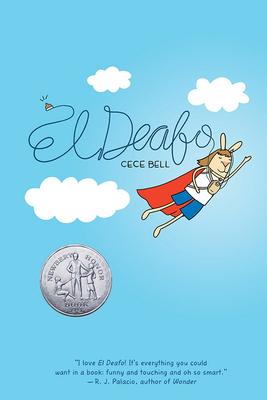 El Deafo should be the first and is definitely the second." "This funny and poignant memoir in graphic novel format about a child grappling with hearing loss, entering school and making friends is ideal for kids navigating new experiences." "This warmly and humorously illustrated full-color graphic novel set in the suburban ‘70s has all the gripping characters and inflated melodrama of late childhood: a crush on a neighborhood boy, the bossy friend, the too-sensitive-to-her-Deafness friend, and the perfect friend, scared away." "This memoir is thus exceptionally informative and entertaining in relation to some aspects of deaf communication, but, most centrally and powerfully, it is exceptional for its perceptive, indomitable protagonist and complex story of friendship, growth, and classroom and family dynamics."